Callous thieves have stolen sweets from a Valentine’s Day raffle raising money for a children’s cancer charity. Staff were shocked to find two men had taken the sweet bouquets from the bar at The Three Fishes pub in Worthing yesterday lunchtime. Josh Jones, kitchen manager, said: “You couldn’t make it up, to be honest. We had them on the front of the bar and two men nicked them. “We looked on the CCTV. We were having a delivery at the time and they took them out the back. Grandpa’s pick “N” mix in Lancing, which supplied the sweets originally, has this morning delivered a replacement bouquet. The Sweet Shack, near the pub in Chapel Road, donated two chocolate bouquets this afternoon and The Co-op in Ferring gave £40 worth of prizes. Paul Gunn, who runs Grandpa’s pick “N” mix, said: “For one year, I have been supplying sweet cones and sweet hampers to The Three Fishes every week and we all came up with the idea to do a sweet bouquet for the cancer charity CLIC Sargent. “They have them on the front of the bar and hanging up. This has been running well until the items where stolen. It has never happened before. “I thought it was absolutely disgusting that someone could just go in there and take something that is for charity. Paul, who is also a cleaner at The Three Fishes, has an online sweets supply business and has been trading for a year. Josh said the raffle for Valentine’s Day will be supporting CLIC Sargent, which is JD Wetherspoon’s charity partner. There will be a cake sale at the pub on Wednesday, February 14, and the draw will take place later that day. The pub’s Facebook post said: “We have been running a raffle for Valentine’s Day to support children with cancer, these being the prizes. Unfortunately this lunch time 2 men have stolen these off our bar and taken them out of the pub. 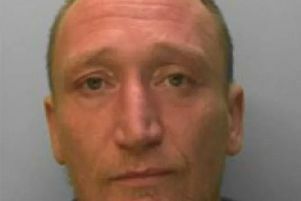 A spokesman for Sussex Police said: “Shortly after 10pm on Wednesday, February 7, police received a report of a theft from The Three Fishes bar in Chapel Road, Worthing. “Two children’s charity hampers, which were filled with confectionary, are reported to have been stolen from the premises between 11.55am and 12.10pm that day. “Enquiries are ongoing and anyone with any information is asked to report it online at sussex.police.uk/appealresponse or call 101 quoting serial 1252 of 07/02. “Alternatively, you can visit the Crimestoppers website or contact the independent charity anonymously on 0800 555 111.